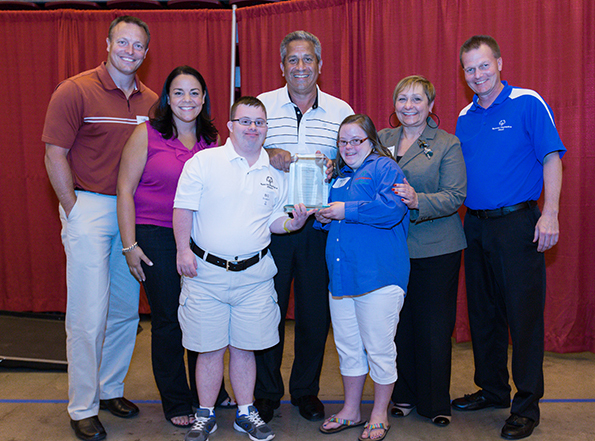 Interior Investments of Lincolnshire has been named 2013 Special Olympics Illinois’ Chairman’s Award. Interior Investments’ owner Mike Greenberg accepted the award at a reception held on June 14 before the Special Olympics Illinois Summer Games Opening Ceremonies at Illinois State University in Normal. The Special Olympics Illinois Chairman’s Award recognizes an outstanding donor or sponsor who has contributed significantly to Special Olympics Illinois through in-kind, volunteer and/or monetary support. Interior Investments is an office furniture distributor that offers design and support services. What began as a whimsical “what if?” has evolved into a major industry event – planned, managed and hosted by Interior Investments. The Annual Office Chair Hockey Tournament is held each year in the beautiful Grand Ballroom at Navy Pier in Chicago. This one-of-a-kind event sells out every year. More than 600 chair hockey players and spectators from architectural, interior design, construction and commercial real estate communities go “chair to chair” in floor hockey rinks made from cubicle panels, all to benefit Special Olympics Illinois. Interior Investments markets and manages the event from start to finish serving as planners, greeters, referees, score-keepers and rink managers for the night. The annual event has raised more than $160,000 for Special Olympics Illinois. Proceeds support the State Floor Hockey Tournament where Interior Investment employees volunteer annually! In addition, Interior Investments has designed and furnished the Special Olympics offices space for Northeastern/Area 13 & North Suburban Cook/Area 18 offices – boasting new desks, credenzas, chairs, state-of-the-art filing system, conference room furniture, work stations and wall art. All of the labor, including design, delivery and installation was donated by Interior Investments – a value of almost $42,000! When the Special Olympics office space grew in 2012, they helped expand the office again without hesitation!